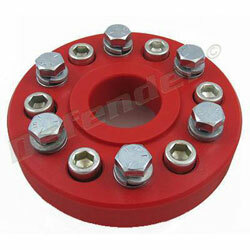 (6) .4375" Bolts / Coupling Diameter: 5.375"
DriveSaver® Vibration-Reducing Components Absorb vibration and reduce noise. The DriveSaver® provides a flexible, non-metallic barrier between your transmission and propeller shaft. This barrier reduces drivetrain vibration, resulting in reduced noise to you, your crew and the water. As a result, you and your vessel are more efficient in this quieter environment. Torque Rating Provided in Foot Lbs. To determine TORQUE rating, use this formula: Engine Horsepower x 5252 x Reduction Ratio Engine RPM. If torque rating is within 5% of the maximum for a standard model, select the Plus Rated model. The DriveSaver® effectively absorbs thrust and torque from the propeller shaft, as well as excessive shock from changing gears and high speed planing. The DriveSaver® provides an impervious barrier that blocks electrical currents from the water. Your engine and transmission are protected from damaging corrosion. The DriveSaver® absorbs extreme shock and torque usually caused by a hidden log, line, or rock. The DriveSaver® is designed to break apart, leaving your transmission and engine intact. That's right, the DriveSaver® gets destroyed, not your costly transmission and engine. And, you're back in operation fast with minimum cost and downtime. The DriveSaver® installs simply and quickly. No cutting or machining is required. You don't have to haul your boat out of the water. Just separate the drive flanges, insert the coupling, align the DriveSaver® and bolt it together. Not sure which Impeller you need?